After our busiest Summer yet for new build and workshop installation work, it’s worth a few minutes to reflect on some of the trends we are seeing in our clients aspirations for Design and Technology. Budget constraints are certainly to the fore but these are not stopping schools and authorities from developing some visionary facilities. TechSoft have been delighted to work alongside clients to deliver great value solutions that will provide them a sound foundation for the future. TechSoft remains the leading provider of CAD/CAM hardware and software for education and every project we deliver will include some CAD/CAM provision. Not surprisingly, numerous developers will come to us for the CAD/CAM parts of projects they are otherwise fulfilling themselves. This is the traditional model – CAD/CAM machines are added to a retinue of ‘conventional’ resources. Two projects we delivered in Summer 2013 did, however, buck the trend and certainly gave us food for thought. You might expect a school that nestles between ultra-trendy Sloane Square and Chelsea’s Kings Road to be forward thinking and our work with St Thomas More Language College did not disappoint. During the early part of 2013, their traditional D&T workshop was stripped bare to give Subject Leader Ayaz Khan the blank canvas he needed. Working with Ayaz, TechSoft were able to design, develop and deliver his vision for a CAD/CAM - driven facility with just sufficient conventional resources to (mainly) support students’ computer-designed and computer-manufactured projects. Working with Hampshire County Council, we also helped Fareham Academy to realise a similar vision. 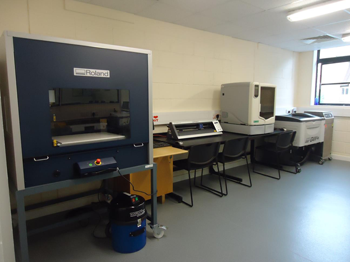 A familiar suite of tired and dusty D&T classrooms were stripped and significantly re-furbished to provide one large CAD/CAM driven design and manufacturing area and one conventional workshop. In both cases, they now have TechSoft machines to provide professional capability for 3D printing, large scale laser-cutting and engraving, 2D and 3D machining, CNC knife cutting and Image Transfer Technology. At this point, you may be shaking your head in despair at the lost opportunity for children to learn through hands-on making and wondering how purely CAD/CAM generated project work will meet exam criteria? You may have a point but, having established this ‘base’ at the capital-spend stage, it will be relatively easy and inexpensive to add more hand tool resources if and when the need arises. The D&T curriculum can hardly claim to be a tablet of stone –change has been (and continues to be) almost a defining feature. Who knows what exam criteria will demand in ten years’ time? I admit to reservations about the relegation of hand-skills but a chance experience this week has certainly made me think. In a lesson I was lucky enough to witness, the Year 8 class were tasked to design a Mobile App to assist one aspect of their school experience. With careful nurturing, the teacher enabled the class to gather and evaluate possible needs, elucidate a design intention, prioritise success criteria and begin story-boarding how the user interface might look and work. The large and mixed class were totally engaged throughout and it was without doubt a very fine D&T lesson indeed. As it turned out, this excellent Head of D&T was delivering an IT lesson – it makes you think. 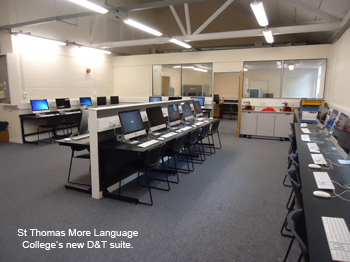 If you have plans to develop D&T resources at your school or college, please don’t hesitate to contact TechSoft. Our Project Managers will be pleased to discuss ideas, develop plans and work with you to deliver the facilities your students deserve.